It had been a few years since I had been to the facility that we had Sawyer’s 3rd Birthday Party at and I wasn’t really sure what the room was going to look like. In the past, the decor of the pizza place we were using wasn’t pretty at all and I really wanted to make sure I had some great photos from this party. I saw some really awesome fabric and photographer backdrops I could get but I really didn’t want to spend a lot of money on it. 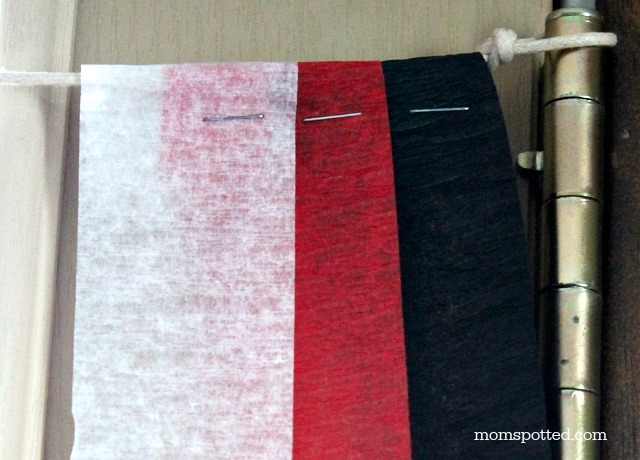 I looked around at the supplies I had on hand and I seemed to have an abundance of red, black and white crepe paper. This years party was the same colors as our Red Black & White Mickey Party we had last year. This was helpful as I could reuse a lot of the entertaining pieces I already had. I love to throw a good party but saving pennies where I can is important too! When I first started making this I was trying to knot the crepe like I would fabric but it wasn’t giving me the layered look I wanted. Just then Johnny came in and asked why I wasn’t just using a stapler. He was right. It worked so much better. We used the twine to make the cord we were going to use to hang it up. I looped it at the ends so we could use pins to tack it up (in the end we just used mailing tape to hold it up). Then we just let the crepe paper out long enough to hit the floor and then folded it over and stapled it to itself. Then we repeated with another color and overlapped it by half and then stapled. This gave it a full, covered look all the way down. Repeat pattern until done. Here you can see it being used by my son and niece at the party. It made for a much better background than the museum’s temporary room divider. 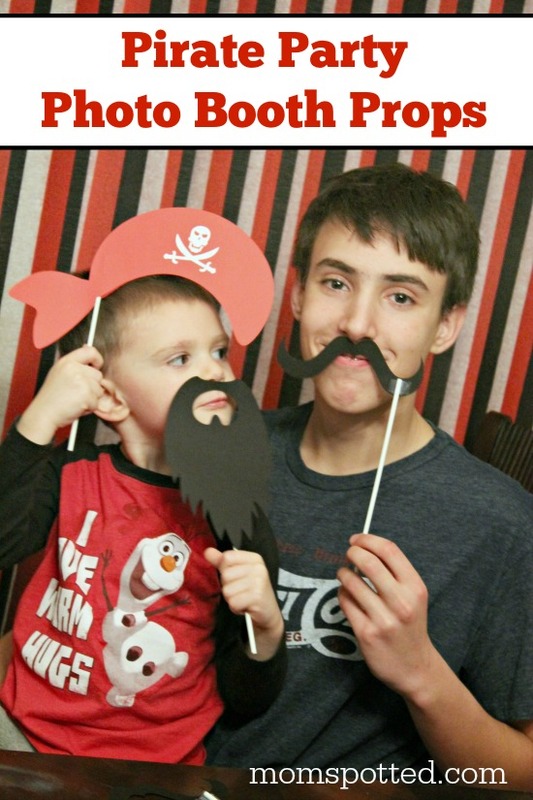 If you love the Pirate Photo Booth Props they are using we made those too! Such great additions to our party that cost us very little! Do you like to make party decor cheap? 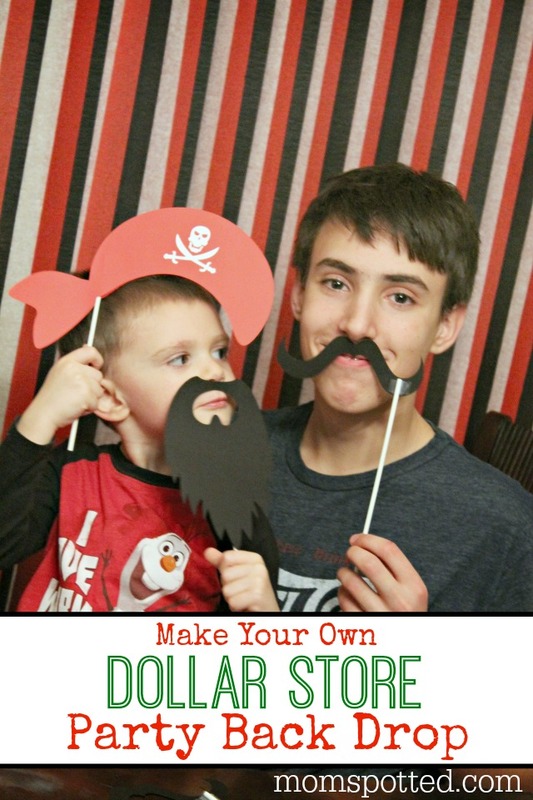 What’s your best dollar store creation? 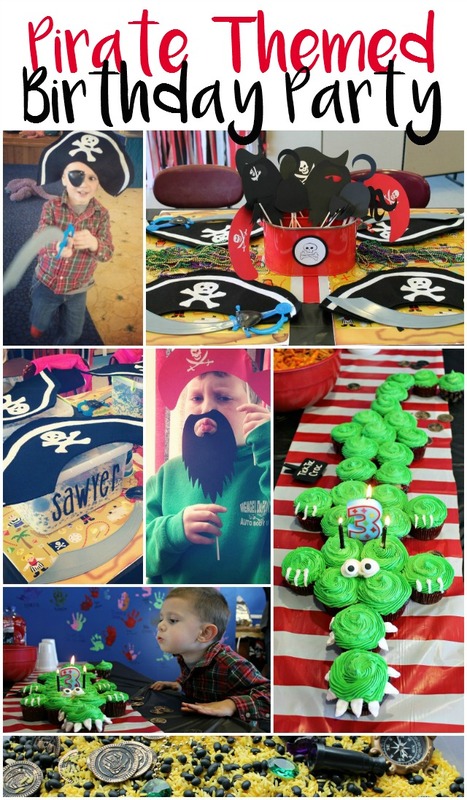 Click the above photo for more on our Pirate Birthday Party. Every Monday we want you to come and link up your latest craft you made with your kids and share here! 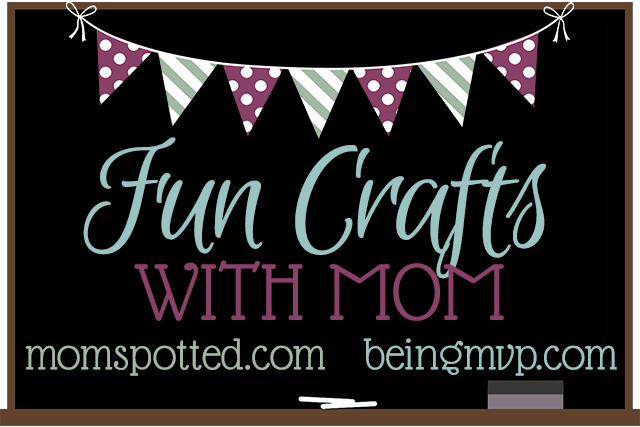 Now head on over and check out Being MVP’s How to Make Pom Pom Decor for Teepees. Such a cute idea. Thanks for the DIY craft. 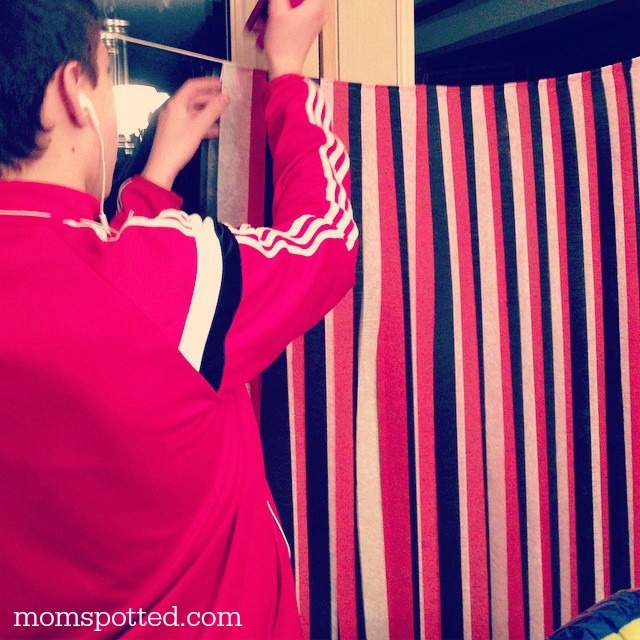 What a wonderful and easy idea using Crepe Paper from the Dollar Store. Love the Dollar Store for all my party and craft supplies! What a neat idea. I just pinned it, I definitely have to try this. What a great idea, I didn’t even think of that – that would have been perfect for our Mickey Mouse Clubhouse party last summer!! I like shopping at Dollar Tree for party supplies. That’s a neat idea for a backdrop! I like the Dollar tree because they mark a lot of the items down to .50 cents and have gotten a lot of fun party items for my Birthdays! 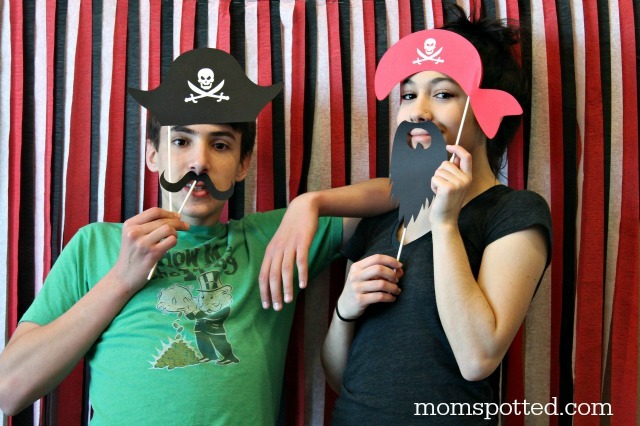 I like the idea for a fun Party Backdrop! I love this- what a great idea! We’re on a very tight budget and my girls’ birthdays are coming up. It would be so fun to have a nice backdrop for birthday pictures. Thanks for sharing this!